Near the mouth of Parleys Canyon, 1938. The red line indicates location of the Wasatch fault. These eight aerial photographs show land-use and urban density changes between 1938 and 2006 at four locations in Salt Lake and Utah Counties. The 1938 photos were taken as part of the U.S. Bureau of Reclamation Salt Lake Aqueduct Project. The 2006 photos were taken as part of the U.S. Department of Agriculture National Agriculture Imagery Program. The general location of the Wasatch fault is shown on the photos at the mouths of Parleys, Big Cottonwood, and Little Cottonwood Canyons as a red line (parts of the fault may be concealed or inferred). This photo pair illustrates near complete conversion of agricultural land to residential and commercial development, along the two Interstate highways (I-80 and I-215). The Wasatch fault is generally not visible in the developed areas in the 2006 photo. This photo pair illustrates significant land-use and urban density changes, including the development of residential neighborhoods, commercial buildings, and an aggregate mining operation. The Wasatch fault is concealed by the aggregate operation in the 2006 photo, due to surface disturbance. This photo pair illustrates similar land-use and urban density changes as Big Cottonwood Canyon, along with the 2006 reclamation of an old silver and lead smelter. This photo pair also illustrates shoreline changes to Lower Bells Canyon Reservoir between 1938 and 2006. This photo pair illustrates on-going conversion of agricultural to residential and commercial land use. In addition, a large area of surface land disturbance is shown on in the lower right corner of the 2006 photo that is not present on the 1938 photo. 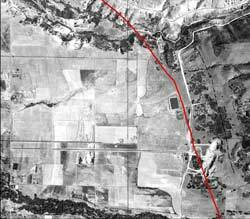 These four locations, along with 178 other photos, are in UGS Open-File Report 537Historical Aerial Photography; 1938 Salt Lake Aqueduct Project; Salt Lake, Utah, and Wasatch Counties, Utah, available as a DVD that can be purchased from the Natural Resources Map & Bookstore.